Gretchen Hammer, MPH, is executive director of the Colorado Coalition for the Medically Underserved. She works with local and state health care leaders and policy-makers to improve Colorado’s health care system. Healing is both an art and a science. On one hand, clinicians are intensely driven by the quantifiable, the measurable, and the evidence-based algorithms that lead to accurate diagnosis and treatment as well as allow us to develop new innovations in medicine. However, healing is also an art. Patients are not just a collection of systems that can be separated out and managed in isolation of the whole patient. Each patient and their family has a unique set of values, life experiences, and resources that influence their health and ability to heal. Recognizing the wholeness and uniqueness of each patient is where the art of healing begins. Empathy is defined as “the ability to understand and share the feelings of another.” It takes presence of mind and time to be empathetic. For clinicians, finding the balance between the necessary detachment to allow for good clinical decision making and empathy can challenging. This balance can be particularly difficult for students and new clinicians. A number of studies, including one particularly large study of more than 20,000 patients in Italy, have been done over the past several years about the connection between a provider’s empathy for his or her patients and patient outcomes, and the results were clear: empathy is significantly associated with improved clinical outcomes. It’s important for both our health and our health care experiences that our doctors, nurses, and other health care providers are able to understand and appreciate our life circumstances. For patients with complex lives and complex health needs, empathy becomes even more important. Unfortunately, additional studies show that medical students undergo a significant decline in empathy as they enter their third year of medical school. This decline is something we must find ways to address so that the providers of tomorrow are equipped to excel at both the science and art of healing. To this end, the Colorado Coalition for the Medically Underserved produced a video and accompanying educational materials that we hope will encourage new conversations about this important topic. The video, targeted primarily to students in health professions programs in Colorado, follows a typical health care visit and interjects important information about the patient’s life that is impacting their ability to get their health care needs met. These factors—things like their income, education, access to transportation, and other social determinants of health—are a part of each patient’s story and are important for providers to be prepared to address. It features several doctors, a nurse, and a pharmacist from around our state who share personal experiences and suggest ways to care more effectively for patients facing barriers to care. 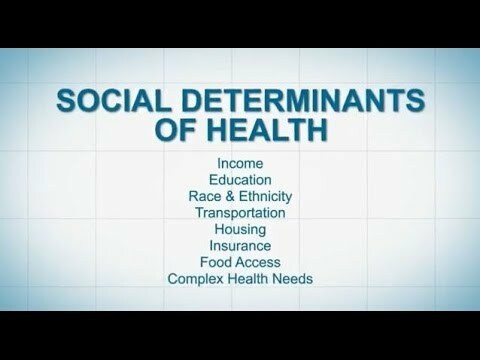 Along with the video, we’ve created a discussion guide intended for students and other small groups to discuss the impact of social determinants in their community. It is our goal to work with our local health professional schools to integrate these resources into their classrooms. We hope to see more newly-minted providers entering the workforce ready to embrace their patients’ lives—as complicated and challenging as they might be—and involve them in their health care. We encourage you to watch the video, share it broadly, and consider what can be done in your community to increase empathy for all patients and decrease the barriers to good health.